Through creative management and a great executive committee, Adepticon has quickly become one of the premier gaming conventions in the United States. Fantastic games, great tournaments and an amazing vendor hall all make Adepticon stand out. This weekend, Badger Games will once again be at Adepticon with many of the great miniature ranges and games we carry. Additionally, Badger Games is sponsoring a fantastic painting contest featuring Regiment Games’ Drantakh science fiction miniatures. More than 30 contestants from a dozen countries have sent in entries. The attendees of Adepticon will decide the winners with their votes. So, stop by the Badger booth to peruse our selection and make your own selection in the painting competition. Viscount Guy de Champinot said it best in his landmark treatise Races of the Known World: “Ogres are enigmatic creatures.” A thick-headed Ogre can be so stubborn as to refuse to move while the world falls apart around him or inexplicably decide to travel 1000 miles to raid unknown lands for food or sport. Often solitary, Ogres can be found as “mercenaries” for all of the known races with no care for the motivation or ideology of their employers. On rare occasions, large groups of Ogres can band together, seemingly out of the blue for raids, attacks and invasions seeking plunder or just food (and anyone or anything qualifies). Whatever the reason, Ogres are formidable foes. Most Ogres prefer the certainty of dry land. However, an adventurous few can be found shipboard in search of new lands to plunder and new things to eat. Most such Ogres fall quite naturally into piracy. 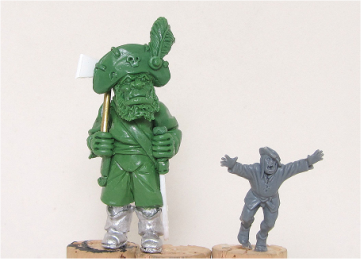 Badger Game is pleased to present Pontoonier Miniatures latest offering of more than 30 fantastic 28mm Pirate Ogres (classic old school Ogre scale). All made of high strength resin. There is even an option for the whole kit’n‘caboodle at a 20% discount! 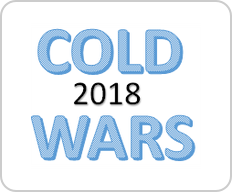 Cold Wars 2018 Here We Come! With no time to slow down after a fantastic Gary Con 2018 this past weekend, the Badger Games team is on its way to Cold Wars in Lancaster PA. We will be there with our own ranges of Pontoonier Miniatures, Mongrel Miniatures and Regiment Games. We will also have the complete Gripping Beast and SAGA lines including SAGA II, Wargames Foundry, Foundry Paints, CONGO, Company D, Great Escape Games, Lucid Eye, The Assault Group, MOFO, Crusader Miniatures and many others. Stop by the booth and ask Emily about the SAGA II specials! Yes that is right, Badger Games has 28mm Barbary Pirates and lots of them. With the popularity of pirate rules sets and their historical impact for centuries, we are shocked there aren't a lot of them on the market already. Well, there are now, and once again Pontoonier has "bridged the gap" in miniature lines! These pirates include a lot of intentionally over the top little gems and this range still has a way to go before it is complete with many specialty sets planned. The European Pirates are designed for the classical "Age of Piracy" centering around 1700 AD but will be at home in many different periods. There are 47 different pirates to choose from. As with the Barbary Pirates, character and speciality sets will follow soon. All of the miniatures were designed using contemporary artwork and are, in many cases, intentionally over-the-top. These miniatures will work with a host of other periods and games and especially with some of the fantastic new fantasy and pirate rules sets appearing in the market place! Pontoonier Miniatures are available exclusively from Badger Games.